“Siri – what are the six stages in child development?” asks Julie Mueller, assistant professor in Wilfrid Laurier University’s Faculty of Education. Mueller’s phone retrieves the search results with speed and displays the academically correct answer to her question. For Mueller, the 2018 recipient of the Donald F. Morgenson Faculty Award for Teaching Excellence in the innovation category, technology now joins lecture content and course textbooks as the third key aspect of a modern learning environment. While the addition of a mobile teaching tool, sometimes perceived as a classroom distraction, could be something Mueller resists, she has a different take. This student-driven, flexible approach to learning creates an opportunity for both the instructor and the students to share knowledge on the subject matter. Mueller defines this as a “co-constructed” learning approach. “I am teaching in a collaborative, co-constructed environment with students, which means the way I assess their skills, knowledge and abilities needs to change,” says Mueller. Evaluation still needs to happen at the individual student level, notes Mueller, but by integrating teams and technology as core components in course assignments, she feels that she is fostering a problem-solving mindset. Students in ‘Principles and Applications of Learning and Development,’ one of the required courses offered in Laurier’s Bachelor of Education (BEd) program, are challenged to identify a problem related to child development observed during their practicum placements and research a viable solution. “Their solution needs to be technologically enhanced,” says Mueller. After the students identify a problem, they begin collaborating with their peers. Groups are established and peer-to-peer feedback is threaded throughout the time that students conduct research and develop a potential resolution to their education-based conundrum. With real issues and operational solutions, students add their research to a cumulative database of problems and tech-enabled solutions. This co-constructed database allows students and instructors to search through a breadth of common problems – and potential solutions – in education. “The learning environment that Dr. Mueller creates is one of collaboration, critical thinking, and creativity,” says former student Jessica Weber (MEd ’15). Mueller’s creative, collaborative learning environments expand past physical classrooms and into online spaces. ‘Learning in 280 Characters or Less’ – the only Laurier course title that needed to change after Twitter recently increased its character limit to 280 from 140 – virtually connects students to learning theory, industry experts, and their own motivations for learning. The online elective is highly active and requires students to use self-discovery and critical thinking to develop their understanding of course theories. Each student starts a personal Twitter account dedicated to the course and completes weekly challenges. Challenges range from sharing learning theory resources and reaching out to industry experts in learning and development, to polling peers on course content. All of these activities are in the spirit of student-directed learning, says Mueller. The course jumps from theory to practice when students are encouraged to learn a new simple skill and then try to motivate themselves using the techniques paired with their selected learning style. Students are graded on their identification and reflection on the theory that best applies to their own approach to learning. These active, technologically enhanced teaching methods lauded by students align well with Mueller’s research track. Mueller completed her master’s degree and PhD at Laurier under the mentorship of Eileen Wood, psychology professor and 3M National Teaching Fellow. She came to Wood with a problem – at the time, teachers were experiencing “technophobia” in their classrooms, even though they were highly competent tech-users in their personal lives. “We realized that the impact of integrating new technology in the classroom was that teachers felt like perpetual novices,” says Mueller. With the issue identified, Mueller shifted her research focus to the barriers to access of technology in educational environments. Now, Mueller studies how technology enhances teaching and learning, and the cognitive changes spurred by technology. She wonders whether technology changes the way we learn and think, or if we need to change the way we learn and think to fit the technology. Innovative spaces at Laurier are the physical manifestation of technology-enhanced learning. 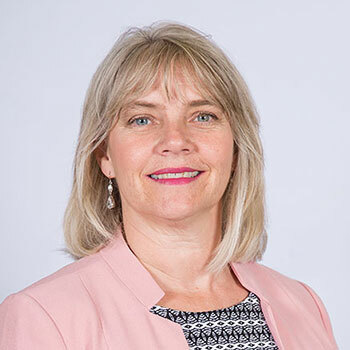 Mueller championed the development of a flexible learning space in the Faculty of Education and is leading a SparksFLY project that would bring stationary bikes into her department’s classroom to encourage active learning.